50 m, 60 m, 70 m depending on where you want to climb, a set of quickdraws, a belay device, a sling and a couple of screw gate karabiners. This Summer has been so good for climbing in general that it has encouraged the indoor gym climbers to seek routes on outdoor crags. The transition is quite difficult for many reasons – there are no blobs leading the way, so route reading is not quite so simple. Recognising foot holds can be quite obscure, and it’s hard to believe you can put your foot on that tiny hold and push yourself up. The bolts are often much further apart, which can be pretty scary especially if the first clip seems to be on the next planet. There are no clip-in belays either, you often have to thread the belay. Outdoor grades don’t seem to be equivalent to their indoor cousins either. They seem to be much harder. There is also the possiblility of loose rock and rock falls so a helmet is a must. 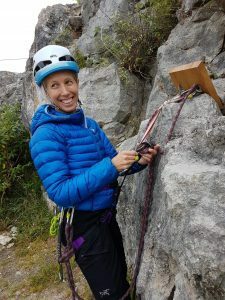 Wyndcliff Quarry has become my first choice venue to teach sport lead climbing due to the shortness of the routes, the ease of access to the top of the crag via a path, the variety of lower grade routes and the quality of the bolts and lower offs. The journey to lead independently is a personal one, which is why the course is limited to 4 climbers. Everyone warms up on top rope climbs to get the feel for the rock and then you are taught how to thread the belay using a block whilst your feet are firmly on the floor. It is a very prescriptive method which allows you to stay safe, not drop the rope and you can use it on ANY type of belay. 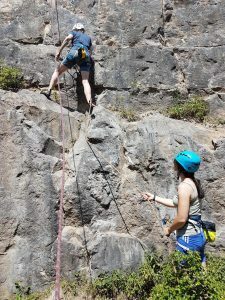 As you progress and become more confident you will be able to adapt your method to suit the belay. You then lead on a bottom rope with a bottom rope belayer and a lead belayer so there is no pressure on belayer or climber. 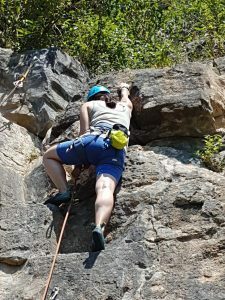 A lower off is already set up so you are safe at all times and once you arrive at the belay you make yourself safe and thread the belay as you have practised. You may only need to mock lead once or 20 times – there will be no pressure, you will move at your own pace as your confidence grows. 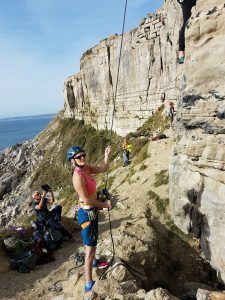 You can then lead on pre-placed quickdraws and finally lead placing your own draws with the belay free to thread. Courses are also available in Portland. If you would like to book on a Sport Lead Course or would like a bespoke course use the booking form to make a booking or an enquiry.